When small business owners consider the term “brand” it often brings to mind large multinational corporations such as IBM, Coca-Cola and Apple and the logos that are burned into our collective consciousness. How, you may ask, does this apply to me, the owner of a single 6 chair general dental practice in Northern California or a 3,500 square foot orthodontic office in suburban Toronto? In fact the strength of your brand is as important to your small practice as it is to the largest blue chip corporation. It is no secret that the competition that exists in today’s dental industry is fierce. Every opportunity to set yourself apart from the masses must be considered. As an architect whose focus is designing dental and orthodontic offices, I would like to touch on how incorporating strongly held principles, such as green design, into your practice can help better define your brand and attract like-minded individuals with similar values to your patient base. Many of the dentists I have worked with over the years initially think of their brand as nothing more than the logo on their business card. While this is certainly an important part of your practice’s identity, a comprehensive brand should extend well beyond ink on cardboard to the overall practice experience. Lets consider the Starbucks brand for a moment (I do realize that there is no dentistry taking place at Starbucks but go with me on this). While we may disagree on the quality of Starbucks coffee, there is no arguing that they have built a powerhouse brand in a remarkably short period of time. On the consumer level, a big part of what that brand means to the customer is the ritual of going to their local Starbucks every morning and knowing exactly what to expect. The sights, sounds and smells are consistent from store-to-store. The physical environment is warm, welcoming and accentuates the products they sell. The interior design reinforces the product, which reinforces the company’s values, all of which add to the overall experience. These values are prominently displayed by Starbucks at every opportunity: from their website to the heat sleeve on your vanilla soy latte to the interior design of their stores. It may be argued that these values only appeal to a segment of the total coffee-drinking population and, by stating these values, you are actually alienating potential customers. 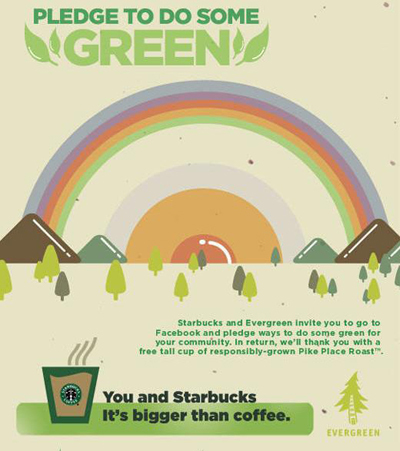 Another way to look at it is that Starbucks is actually targeting the demographic that they are interested in doing business with: like-minded individuals that care about the planet they live on and are willing to do something about it. More than 17,000 stores in 55 countries is proof that there are more than enough folks in this target audience for a successful business plan. So how does this apply to your dental practice? With the increased awareness of the environment that has continued to build over the past 10 years, it is curious that more dentists have not embraced green principles as part of their philosophy, office design and, by extension, their brand. This is not to suggest that these principles are something that should be adopted casually. Like anything that is worthwhile, it requires a passion and commitment from the dentist that is genuine. But for the professional that is sincere about going green there is a unique opportunity to integrate the overall experience so that there is a consistent image of the practice being presented to potential patients. Unfortunately, the office design is, all too often, disconnected from the rest of the brand elements and a valuable opportunity is missed. Keep in mind that, in most cases, your patients will meet your office before they meet you. Why not take advantage of the opportunity to present yourself, and what you believe in, to your community through the design of your office. If you are passionate about green dentistry, green design or just the Earth in general, make it part of your unique practice brand and let it attract the type of patients that you would like to have a cup of coffee with. Joseph Miller is a principal with JoeArchitect, an architecture and interior design firm located in Denver, Colorado that focuses on dental office design across North America.